I live in a condo and my bedroom wall is right against the bedroom wall of the neighboring unit. We used to have a very passionate couple as our neighbors and, boy, they made love really noisily. I didn't have to press my ear on the wall behind my bedroom door. We can hear them from our bed from across the room! I used to tell Vince, "Dammit, let's do it and drown them out!" Well, they moved out some time ago and so, last week, I found a new thing to do with that blank wall: It will be where I keep my necklaces! ... this was a true labor of love. Tada! So neat and pretty! I have a lot of necklaces but I never get to use them much because they're all bunched up in a messy bowl. Really terrible. So I edited my collection and decided that I will only keep a dozen. Yes, just 12 pieces! If I want a new necklace, I'll have to get rid of an old one. The simple solution above really helps! Thank you so much, Vince! I super love you for organizing my life! 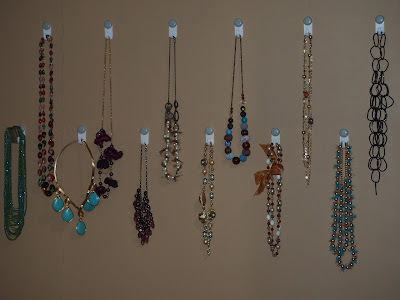 Saw something similar in an IKEA catalog and will hang my necklaces the same way too, instead of hanging them wherever. Your necklaces are so pretty! Where do you usually get them? I'm especially loving the turquoise ones. Dea, most of them are handmade by friends =) Actually, I only have 3 necklaces that I bought from a shop. All of my necklaces were made by friends! I have a ton of necklaces. We can't drill into the walls (renting) so I decided to hang them from the closet doorknobs. It works, and looks nice too! frances! that second necklace from the left. is that from benjie angeles from 2005? i have a similar one and i also still have it. it's a gem kasi! LOL at your noisy neighbors! I think we used to be like those people. Hahaha! Very sweet of Vince for organizing your necklaces and sort of decorating your bare wall. 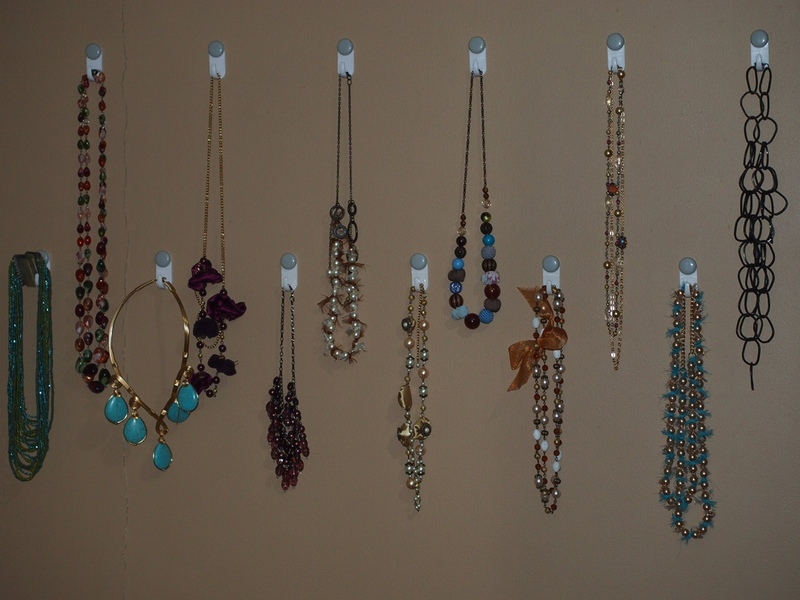 This is a great alternative to those necklaces/bracelet holders ah.